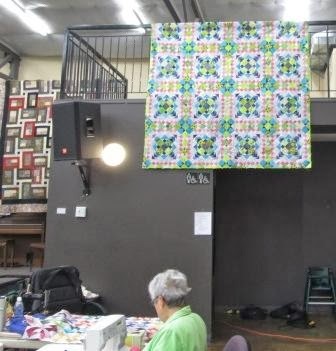 Here is my Easy Street quilt top hanging from the railing at retreat. The lady in green is my mom, Betty. I had all the blocks done before but took them to retreat and got them together. I still need to do the boarders. But it is getting closer to being done. 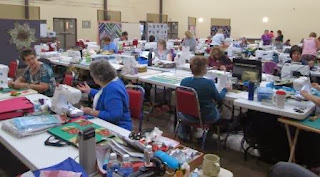 I hope to get the boarders on before Bonnie Hunter's next mystery quilt that starts in November. 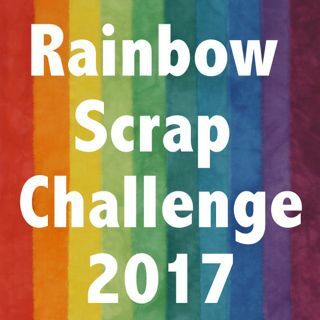 I am planning to do the next again this year. Here is a photo of the room. I believe there were 37 of us this year. It is run by my Aunt Arley and held at Sunnyside Camp on Sylvan Lake. I broke my special seam ripper, dropped it on the floor. I left it in the garbage can. I will have to make a new ripper. I feel I am short a seam ripper even though I dug out a cheap one. Not the same as the one I had. Your "Easy Street" is spectacular, Cathy! I'll bet it feels good to get the top put together, even if you still have the borders to do. Easy Street looks great. I have to get the borders on mine as well...been done for months to this point. So sorry about your specially personal built seam ripper - (RIP) Looks like a happy productive group of retreaters. It looks like a grand group of ladies spending lots of wonderfully productive time creating and playing together. Your easy street has turned out so beautifully- You are on creative roll.